Targets specific muscle groups and maintains proper alignment in the shoulders. Works to improve symmetry, balance, and coordination. As a therapeutic tool, can be combined with Flex-bands, exercise ball, mini trampoline, or other workout equipment. Can be used for spinal alignment, fall prevention, surgery recovery, personal training or osteoporosis therapy. Documented effectiveness in injury prevention, advanced age mobility, rehabilitation, and athletic performance. Accessible and adaptable for all lifestyles. Created for Everyone, Endorsed by the Elite, Adopted by the Fit! It wasn't long before professional athletes were including the Premiumgym in their workout regime. A wide range of sport enthusiasts in soccer, cycling, race car driving, martial arts, bodybuilding, yoga and others noticed the unique benefits of the Premiumgym. Imagine a health and fitness tool that provides benefit for the elderly, the disabled and the athlete. From a slow, fluid session to a fast, aggressive session, from 9 to 90, everyone can improve with just a few minutes a day with the Primumgym. The Antigravity movements for the arms and shoulders guarantee optimal position of the shoulder joints for safe effective rehabilitation of shoulder dysfunction. The gentle way to health and fitness - despite physical limitations. Move to the gentle way to greater well-being, health and fitness with the Premiumgym! The innovation for a functional, playful and highly effective workout. It's fun and supports the body in its natural movements. The Premiumgym decreases the stress on the joints and still maintains a full training effect. All your movements are coordinated by two telescopic bars, like cross country skiing. 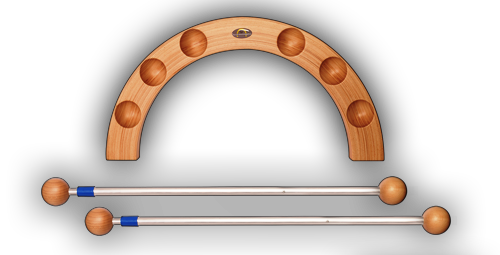 The bars, with their solid wood balls, can easily be put into the cups of the board while standing, sitting or lying! The Premiumgym coordinates strength, function and flexibility. Shoulder, back and neck areas remain relaxed. The muscles are loose, blockages are dissolved with gentle training. It's as if your personal trainer is at your side to guide you to a healthy, effective and sustainable functional exercises. The Premiumgym can be combined with many materials such as mats, pillows, balls and elastic bands. So the training is always new and varied. This system stores quickly and easily, always ready to be used, easy to transport and takes minimal space. It has been documented to have a wide range of applications by the DBS Academy in Germany: e.g. in prevention, geriatrics, rehabilitation, sports or people with disabilities. The non-slip boards can effectively be used in schools, sports clubs, in group and individual therapy, in the medical clinic or especially at home!